The Atomix 600HT is said to strike a sweet spot in size, performance and price. The brand’s latest hardtop fisherman model seems to be deserving of a serious look by anyone in the market for this size boat. Cockpit set up well for "fighting fish"
The latest range from Atomix represents some significant differences from earlier models. A major difference has been the move from hand-laid GRP to vacuum-bagged solid GRP, providing a higher quality of hull that is also more rigid. The new 6m range is now available in three different configurations, including this hardtop fisherman. 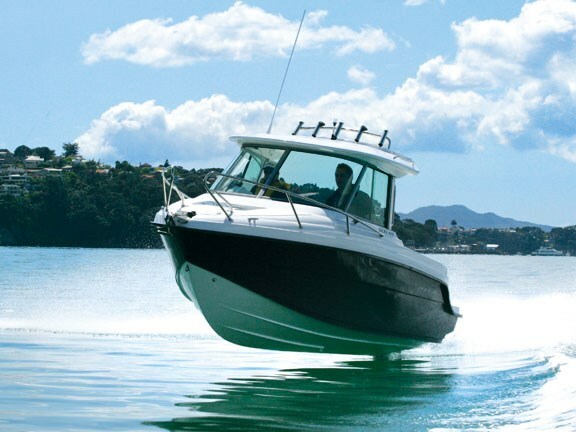 The boat is rated from 90 to 150hp, so this direct-injection Optimax is right at the top of the range. Emissions have been brought down to achieve a CARB two-star rating, with performance and fuel economy that is comparable to many four-strokes. The boat is supplied on a custom-built tandem-braked trailer. All the running components are from Al-Ko. The boat rides relatively high on the trailer, but thanks to eight sets of quad wobble rollers, it launches and retrieves easily. Starting at the bow there is an unusually high bowrail, which is split across the bow. The design allows someone to step directly onto or off the bow from a wharf or similar structure. The textured surface of the anchor well cover gives a good footing while the height of the rail provides an easy handhold. 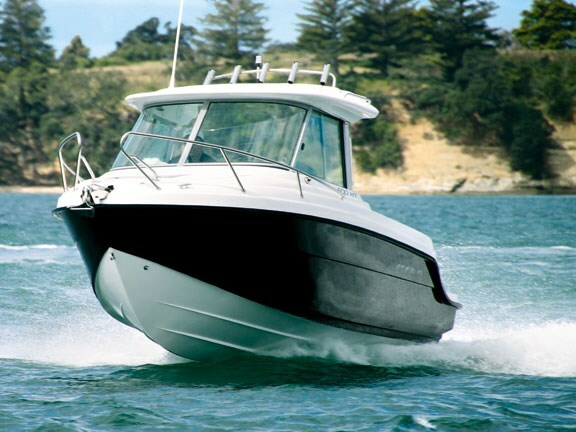 Without access around the hardtop, a large hatch in the bow allows one to step down into the cabin. The self-draining anchor well is set up to allow an electric capstan or winch to be fitted. Atomix has designed flush-mounted stainless units to fit in the angled coaming of the cabin surround. This holds a rod almost upright. 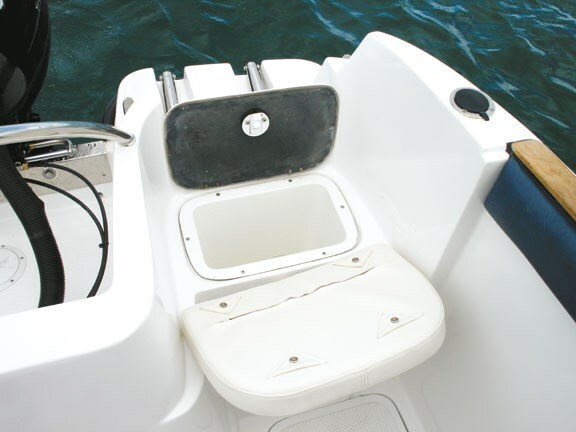 Combined grab handle cleats are fitted to either side of the transom, designed and manufactured by Atomix. The Atomix 600HT has a full-sized hardtop canopy, complete with a stainless five-rod rocket launcher. The back edge of the roof is gently curved inwards, to ensure the hardtop does not impinge on "fighting room" in the cockpit. The quality of finish is reasonably good, arguably equal to that of some Kiwi-made boats. These vessels are finished off with an inner mould that forms a double-skinned hull for most of the boat’s length. Although not designed as on overnighter, an optional infill is available to create a serviceable double berth. There is no under-seat storage as all the under-floor area is sealed to provide reserve buoyancy. The cabin drains into the bilge and can be washed or hosed down. A courtesy screen is available to close off the cabin and there is a space where a cassette-style toilet could go. The helm and passenger position is fitted with two upholstered seats on moulded pedestals with sealed under-seat storage. A large curved windscreen and narrow pillars give this hardtop an almost unencumbered 360-degree field of vision. 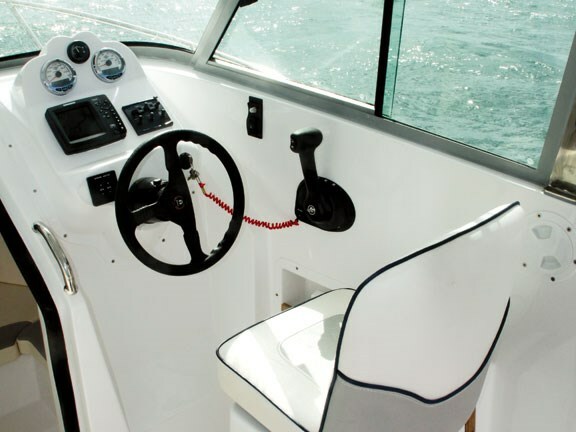 The helm layout is good, with hydraulic steering and scalloped dash. 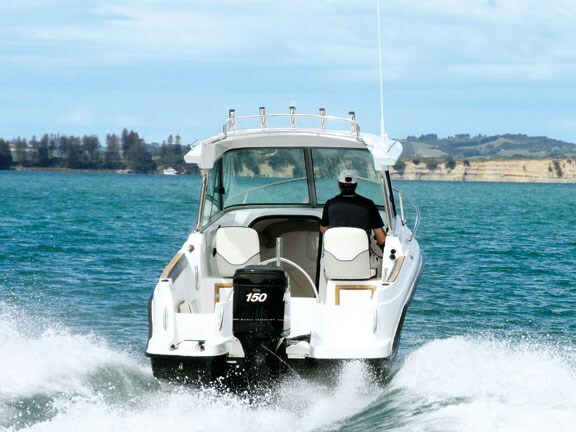 The Mercury Smartcraft LCD displays show a range of engine and boat information to supplement the analogue speed and RPM displays. A conventional fuel gauge and a Humminbird 788ci combo GPS chartplotter/fishfinder completed the displays. The entire cockpit is finished in an anti-slip tread and is self-draining. In a boat this size there is no space to waste so everything needs to fit together compactly and efficiently, something Atomix has tried to achieve. 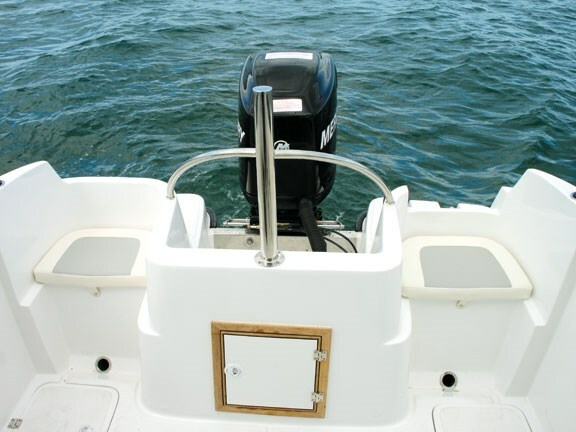 Upholstered side seats swing out from either gunwale on stainless brackets when required, but easily drop down out of the way when serious work starts. Two wet lockers set into the floor on either side of the cockpit can hold the catch or wet gear, although unfortunately when the side seats are down they impinge on the hatch cover opening. Two further upholstered seats in each side of the transom hide bait tanks. The outboard well in the centre intrudes into the cockpit somewhat but houses the battery and master switches behind a sealed hatch. The stern has boarding platforms either side of the motor, with a stainless boarding ladder recessed into the port side. The Mercury Optimax is a good match for the boat, getting it up on the plane very quickly. With the open cabin the motor’s noise was quite obvious even at idle. We opened up the throttle and the boat took off like a scalded cat. Thirty knots was no problem with plenty in reserve. Despite the boat being relatively high in the water it was stable at speed due to the planing strakes under the hull. Moving around underway produced little discernible lean. The boat proved easy to manoeuvre at slower speeds. The stability underway was replicated at rest. The boat backs well. The boat tracks well through turns, again aided by the planing strakes. At speed the hull is running almost entirely on the lowest strake, resulting in reduced wetted area and minimal drag. We found this to be a good quality boat, punching well above its weight in terms of features (and space) for your dollar. 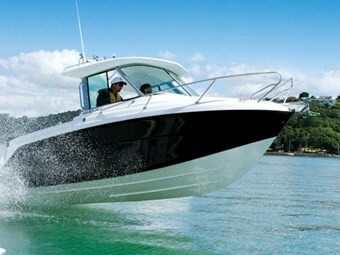 See Atomix boats for sale.